A Colorado woman with multiple sclerosis says she’s out $35,000—her life savings—after she returned the fridge in which she’d hid the money. Now, she’s sought the help of a Denver news station in tracking down her lost cash. You have questions; we have questions; let’s go through these questions. 1. 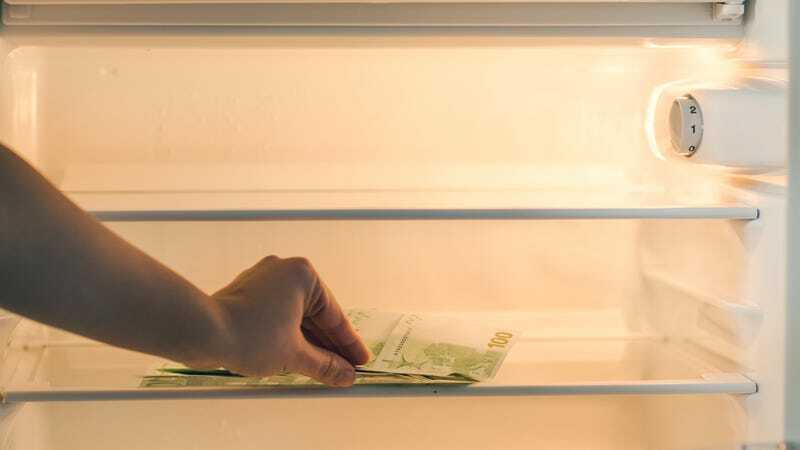 Why hide cash in a freezer? “I had it in the freezer because if the house burned down, the freezer stuff doesn’t burn,” the woman, Renee Reese, tells Contact7 Investigates, the investigative wings of Denver TV station KMGH. She says that because of her health condition, she tried to minimize her trips to the bank. 2. How… does this logistically work? Reese says she sealed large-denomination bills in Ziploc bags, then wrapped them in white towels, which weren’t immediately noticeable when the third-party service contracted by Costco came to her home to pick up the refrigerator she was returning. 3. Why return the refrigerator? Reese wanted to exchange the fridge for one with French-style doors that would stay open, making it easier for her to reach the items inside. 4. So where’s the money? After the appliance pick-up team left, Reese says she and her daughter both told each other something to the effect of: “I thought you grabbed the money.” Reese filed a report with her local police department and called Costco, which tracked down the refrigerator but didn’t find any money inside. The news station also contacted the third-party company that conducted the pick-up; it said it hasn’t seen the money either. 5. What’s the moral here?